This is what happened when we played New Year’s Eve in Paradiso, Amsterdam! ‘The Smoke Eaters’ are two audio/visual artists and DJs (Simon Melia and Paul Jay) that take elements of the last 100 years of popular culture and re-edit them with cutting-edge underground dance music. Film, television and music videos are given new interpretations, designed to wow audiences with a ‘what you see is what you hear’ philosophy. This has already seen them performing at major festivals and venues worldwide such as Glastonbury (UK), Sziget (Hu), Splore (NZ), Oxegen (IRE), Razzmatazz (Es) and in their home base city of Amsterdam at Paradiso. It was through their enthusiasm for Paradiso programmer, Maz Weston’s long running “Rocket Cinema” project (where artists and musicians re-score classic films) that she invited them to take the concept one step further for Rocket Cinema’s participation in the 2012 edition of Amsterdam’s “Museum Nacht”. 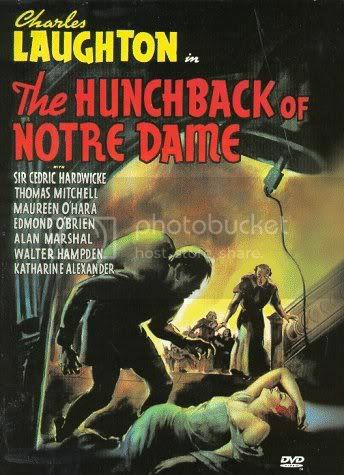 The design brief that they were given was deceptively simple: Compact, re-tell and re-score ‘The Hunchback of Notre Dame’ using the various interpretations produced through-out the 20th century. The earliest version dates back to 1923 and the most recent was a nineties Disney animated musical! The creative process itself became a voyage of discovery. 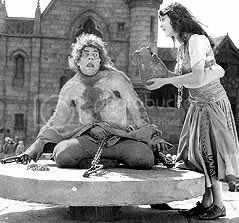 The lengthy task of cutting up the various films in order to create a modernised tale forced the audio/visual duo to re-examine the story. It meant taking the strongest characters from each version to develop a piece of contemporary ‘Pop Art’ that would compact into the allotted half hour’s “show-time” whilst maintaining the narrative flow and holding the audience’s attention. It was a challenge in itself to take modern film making and editing techniques, not to mention a contemporary sound-track, and apply them to what can only be described as cinematic history. To make, for example, an eighty-nine year old piece of cinema (the earliest version) relevant to a 2012 audience required many a session of ‘brain storming’. Ultimately though, The Smoke Eaters feel that the audience will forget their awareness of the cutting and interlacing of the five different versions used, but maintain this enough to view the story in a refreshing manner. This was their ultimate intention. Razzmatazz, Barcelona, a rocking night again! ‘Wonderground’ @ Paradiso, Amsterdam. What a hot and sweaty night indeed! Headlining ‘Wonderground’ Party, Paradiso, Amsterdam Sat 26 May! More of a FESTIVAL than a Party with this enormous line-up of cutting-edge talent. The Kiwis are a rockin’ audience to play for….much respect! Rocket Cinema Festival – The Smoke Eaters play the afterparty on Sat 26 Nov.
‘Rocket Cinema’ – A concept where classic films are shown in fantastic locations with brand new soundtracks performed live by bands, Producers and DJs. The festival runs in various locations from 28th October until 26th November. The Smoke Eaters are lucky enough to be playing at the afterparty in Groningen (Puddingfabriek) on Saturday 26th November 2011. We’re warming up (2300pm ’til 0100am) for the mighty DJ JFB (UK DMC Champion) alongside our friends from the ‘Cheeky Monday’ crew! Audio/Visual mayhem followed by jaw-dropping turntable wizardry! A taster (if you\’ve never seen it) of what to expect…. And checkout DJ JFB\’s skills here! Wednesday January 14, 2015New Mini Mix – New Chapter! Wednesday October 8, 2014The Smoke Eaters Halloween shinanigans! Wednesday July 2, 2014Glastonbury 2014 rocked! Monday June 2, 2014We’re back and we’re playing 3 times at Glastonbury!! Tuesday September 24, 2013Our re-scored showing of the Dutch 80s film classic ‘Amsterdamned’ was a sold-out success!